Mulgrew welcomes us to last DA of 2015. Notes out of order as Mulgrew jumped back and forth between local, state and national. January 11th SCOTUS hears arguments on Friedrichs. Retirees will be there. Trying to organize labor leaders locally and nationally so our voices can be heard. Says handful of people want to take away power of working folks to organize against billionaires. ESSA—Mulgrew said we couldn’t do anything until Feds moved. Says UFT worked on this during summer and Thanksgiving. Says it’s all about timing and when there is political climate to do something. Says Democrats fought for Title One, which was what this began with. Says NCLB came out and for long time there was no agreement to change it. Says it labeled many schools failures. Mentions RttT waiver program that waived certain punishments. Says states who did not take it lost large amounts of Title One funding. Suggests losing it would have cause 30,000 teacher layoffs. Says AFT took lead on it, demanded Title One funding. Says they wanted federal government to stop mandating student test scores used in education, wanted help rather than punishment. Says quality of schools is no longer only test-based, and that schools now get credit for offering art and music. Says many people say there still must be accountability, but that we need tests so we know which states are doing well and which are not. Says tests will only be used for informative purposes at state and local level. Says within a ten day period feds finally changed the law and no longer mandates use of test scores. Says this is great win for us. Mulgrew says when US President says there’s too much testing, it says a lot to the country. Praises president for saying teachers need some respect, and for saying art and music needed to come back to schools. Mulgrew says that is the work of the union. Mulgrew says think of where we were a year ago. Mulgrew says he was telling us all to prepare for war. He says between Christmas and New Year people were strategizing. Says we educated parents and Bloomberg’s polls went down. Says it’s great achievement that feds are not using test scores. Says this took years of planning, and it was shocking when so much happened last Thursday. Mulgrew says we need to relax. Says we’ve been closing schools for 30 years and we only had problems with Bloomberg. Cites Duncan saying he wanted to close worst 100 schools in country, and Bloomberg saying he’d close 200 in NYC alone. Says reporters were unaware, but there was always a school closing process. Says chancellor is closing 3 schools, two on Renewal list, but for enrollment reasons. Mentions schools with fewer than 200, or 50 students. Says schools cannot work well if they’re that small. Mentions shifting student populations. Says people are moving from residential to industrial neighborhoods and this may cause schools to move. Says there are areas in crisis for lack of school seats. There is a school visit app, so every time a UFT person goes into a school they can make a report. UFT wants documentation on schools it visits, averaging over 100 a day. UFT says these schools need supports, and politically, there’s a lot of pressure to close these schools. Mulgrew says UFT is upset that plans communities put together are not being followed. UFT frustrated because there is a problem with rollout of huge number of these classes. Says it helps kids when done appropriately. Says they are not being implemented or used correctly, to smattering of applause. Deputy Chancellor is denying these problems, saying all principals are doing it correctly. Mulgrew asks us to complete survey. Mulgrew reads questions aloud. I finish well before he does. Many in audience say they did not receive survey, and Mulgrew directs them to Rich Mantel. DOE has to monitor how many meals are served each day. They need to know how much is being discarded. 70% of breakfast meals are thrown away. Problematic because we want children to eat. Therefore DOE has pilot program. DOE wanted to expand to 300 schools, only 30 took training, and program is a disaster. Says kids are being served frozen pancakes and expired food. Says school community is unprepared but told they have to do it. Says UFT will fight this unless it is fixed. NYC received same communication as LA, was in communication with UFT, and was done very well. Says it’s inappropriate to disparage LA, particularly considering San Bernadino. Says we had people who could speak to issues. Says commission report said we have to redo standards, says they admitted they had to fix screw up. Someone asks, “Wasn’t that the opt-out movement?” and Mulgrew opts out from responding. Says commission insisted on time to develop curriculum, including for special ed. and ESL. Says it will take a long time. Says this will require teacher training. Says parents will need to be informed. Says all assessments must be aligned with the work we do. Says teachers will be involved every step of the way. Gets applause. Says committee took step further and said growth scores could not be used until all this work was done. Says this is all about politics. Says Albany is going into legislative session, pols don’t want to talk to anyone, want to do their work and go. 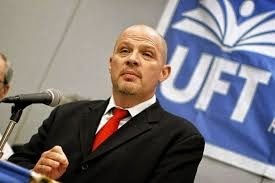 UFT is focusing on funding. We want CFE money lowering class sizes. Says he wants charters to serve same kids and keep them. Points out Moskowitz is shortening school day, ridicules her for going back on longer school day, which she’d said made her schools better. Amazed she showed sympathy for overworked staff. Says we will work with local pols, but it’s an election year and no one wants to talk. Says there’s not much we can get done right now. Says one year ago we knew we had a governor trying to kill us in one fell swoop. Says we still have danger, like Friedrichs. Says this ties to Friedrichs. Can we do all this work it it goes the wrong way? Mulgrew says no. Mulgrew brings up woman who was on commission. Is well recieved. Says we’ve accomplished a lot, federal law has changed, but that starting right now they cannot use state growth scores in teacher evaluations. Says we should relax and urge principals not to do so much test prep. Says president says we should bring back joy of learning. Mulgrew goes over poll results. Says many IEP have been asked to be changed, teachers are pulled out of IEP classes, most schools don’t cover when co-teacher is absent. 2 of 3 have common planning time. Few have received PD, less than a third. Says that’s inexcusable, and is result of imperial principals. Mulgrew wishes happy holidays to all. 5:23 PM. mentions giving coats to young people. Speaks of Coalition for Homeless holiday party. Asks we thank Michael and Randi for efforts in ESSA. Mentions 2016 HS awards. Next DA January 13th. CL—PS 87—What do we tell members about Common Core? Retiree—Since 2 of 3 men in room going away, how will it impact us? Mulgrew says everything gets out and we aren’t supposed to electronically communicate. Says it means there’s still a lot of activity, but if we need to get things done, it will be very difficult. Says election year is big question, particularly Senate. Says he’s glad the only thing we need is funding because not much will happen this year. Queens delegate—Says she has math 8 times a week, but co-teacher only there 5 times. Says AP said it was OK. Mulgrew disagrees. Says if IEP says kids need instruction in ICT class, they need it all the time. Refers her to special ed. rep.
CL—Can Mulgrew talk to Fariña about cell phones. Mulgrew asks what committee decided, doubts process occurred. CL says it didn’t, tells story of bomb threat. Refers her for help in UFT. Wants to make sure threat is reported. CL—How engaged are we in process of making sure Renewal schools get what they need? Mulgrew says they are very engaged, working full-time. Says DOE says everything is great but we know it’s not. Q—What does it mean if feds don’t mandate use of scores? Mulgrew says state cannot use state generated growth scores on teacher eval for next year. Mulgrew says Regents still count toward graduation. CL—What about teachers rated ineffective due to CC standards? Mulgrew says they will still stand, but that they used to average 2,000 bad ratings a year, and that we’re now at 700. Mulgrew asks whether student learning is a test score, projects, or portfolio. Says other part of commission says we must develop other things that constitute student learning. Asks whether test scores are best evidence. Says we must fight to make sure we don’t lose momentum over what learning is. Says he’s project based. Calls time. Allows one more question. CL—What happens with local measures? Mulgrew says local measures are still in. We have to talk with DOE, but local measures are in place. Mulgrew asks should it be 20% student learning and 80% principal opinion. Crowd says no. Opposing state receivership—Janella Hinds, HS VP, introduces unified resolution about receivership. Speaks of how important it is to show solidarity. Asks to place on next month’s agenda. No one speaks for. James Eterno speaks against. Says he wrote some of it, but he didn’t get a chance to go back to his caucus. Says last resolved talks about educating members about receivership. Says if we’re not going to go to Albany and try to reverse awful law, that this is meaningless. Says Regents cannot reverse receivership and reverse receivership. Reso in support of Chicago Teacher Union for next month.—Stewart Kaplan, CL, says it’s about standing united with Chicago, and about our own future. CTU wants smaller class sizes, 3% increase and pay for snow days. affordable housing—average rent in Manhattan 4K monthly. Teachers and paras cannot afford to live there. Rents unaffordable for low income families as people are priced out. UFT wants to increase affordable housing and ensure diversity in our city. Janella Hinds proposes to strike #2 in resolve. David Pecoraro opposes striking #2. Mulgrew wishes to debate. Says he’s a teacher at Grady High School. Says he’s tired of NY teachers having to work in PA. Says people cannot wait for political process. Says we need space for us to live close by, and opposes amendment. Woman speaks in favor of amendment. It is now 6:03. Mulgrew adjourns, urges us to relax.